Nick Khoury is not a name that will be familiar to many of you out there. But what he did for you as an engineer working at Continental Can on Chicago’s Southwest Side impacts your lifestyle till this day. Khoury was like the Steve Jobs of his generation. While Jobs reinvented the computer laptop, giving us the tablet, Khoury invented the “Easy Open” tab for pop cans and food cans in 1963. The introduction of the easy-to-open metal can top in 1963 led to an increase in the use of metal cans rather than glass bottles for beverages. By the end of 1966 over 45 percent of U.S. beer and over 15 percent of U.S. soft drinks were packaged in metal cans. I don’t know what life would be like if I had to scrounge around to find a can opener every time I wanted to drink a can of pop. And Baby Boomers like me thrived on pop, drinking more of it than we ever drank water. Khoury made it easy for us to open the can, by pulling on the “tab.” The “flip top” is how I remember it being called. And then there was the tab that stayed on the can, preserving the tab for recycling. And he also designed the full removal of the top of cans, which we also take for granted today. Nick Khoury changed an industry and influenced American life. Ironically, partly because he is Christian Arab, he was never acknowledged for his achievements by the Arab organizations or Middle East engineers. I was able to document his story in my book Arabs of Chicagoland, which was published by Arcadia Publishing in 2005. Scouts and other public service organizations collect the pull tabs from pop cans to raise funds for charitable efforts. It’s so much a part of our life, that its understandable that so many people take it for granted. A pre-computer era invention. Khoury had 44 patents to his name. Khoury was born in a suburb of Jerusalem, Palestine in 1921. He immigrated to America in 1952 with the help of the Lutheran Church and graduated with a degree in engineering. He had a good job in Jerusalem working for Augusta Victoria Hospital, which was named in honor of Augusta Victoria of Schleswig-Holstein, the wife of the German Kaiser Wilhelm II who visited Jerusalem in 1898 to strengthen the Christian presence in the Holy Land. I’ve known Nick since I was a child going back to the 1950s. My father helped many Palestinian Christian immigrants settle in Chicago in the 1950s and 1960s and Nick came to our house so often, we called him “Uncle Nick.” He was like a member of our family. Not just because he was a Christian from the Holy Land, but because he was a man of faith, he attended church services often, most recently at Good Shepherd Lutheran Church at 78th and McCarthy Road in Palos Heights. Nick married his wife, Shirley, in 1967, and they remained married for 47 years, living in Worth. Nick Khoury died on Saturday, Dec. 29. He was laid to rest at Chapel Hill Cemetey in Oak Lawn, following services at Good Shepherd Church. Nick Khoury was 93 years old. You can read more about Nick Khoury’s history online at http://www.TheArabDailyNews.com. 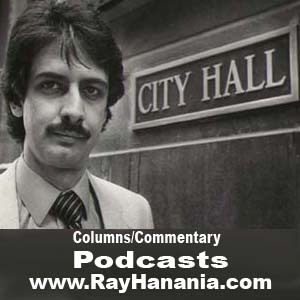 Ray Hanania is an award winning columnist. Reach him at http://www.TheMediaOasis.com or follow him on Twitter at @RayHanania — City & Suburban News-Herald. Hanania is also the managing editor of the Arab Daily News online.